This modification was developed by Dan Hagman. I modified my The Addams Family pinball machine with extra GI-lamps on the playfield. No leds, just regular lamps that are wired within the existing GI. 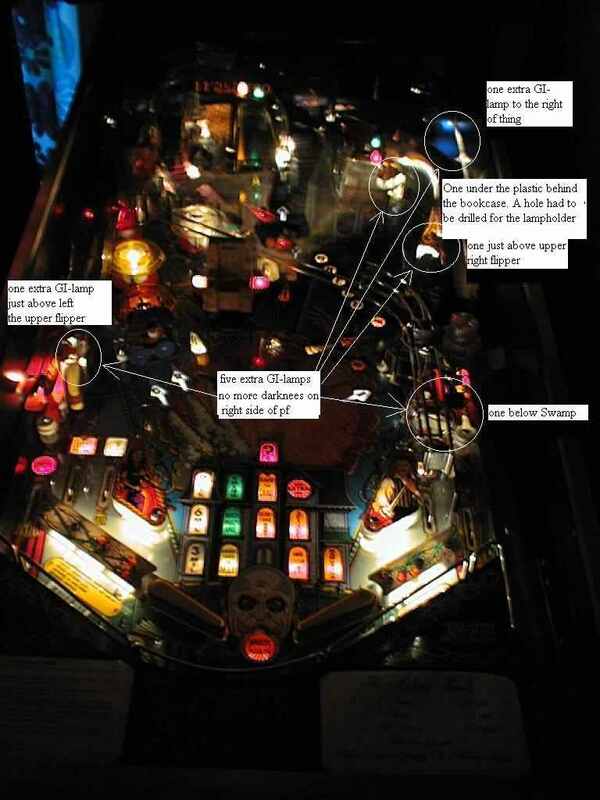 Four of the lamps are mounted on the right side of the playfield. That side is almost all black because of lack of original GI-lamps. One lampholder was mounted under the plastic below the Swamp (right above the right outlane). Another lampholder for GI-lamps was mounted just above the upper right flipper. The third lampholder was placed under the plastic behind the bookcase (I had to drill a hole in the playfield because of lack of space for the lampholder). I also put one extra lampholder to the right of Things box and one extra GI lampholder just above the left upper flipper. A total of 5 extra GI-lamps to lit up the playfield were it's needed. NO more blacked out right side of the addams playfield.